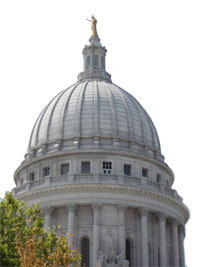 EVERY THURSDAY, ongoing at the Wisconsin State Capitol, 7pm at the State Street Steps! It’s powerful, do not miss it! People are raving about this inspiring video that captures the Capitol Rosary Rally and its purpose. Bishop Morlino’s remarks at the first Rally are included. There is also the great, faith strengthening story and pictures of the Catholic family that found the balloon rosary we launched, the next day in Northern Michigan! We’re calling Catholics nationwide to pray the Rosary for Life, Family and the Conversion of the World at YOUR State Capitol. Hundreds gathered for 15 decades of the Rosary at the Capitol: “That’s mighty!” as Fr Rick Heilman put it! believer I have great admiration for the reverence for God I see in your attitudes, masses, and traditions. Because we live in an era where God’s ways are so painfully challenged I want to to acknowledge that like never before Protestant believers and Catholic believers are in accord. We will join together in showing Christian love to the world while acknowledging God’s amazing Holiness. And may His Grace for all of us attract the World to His precious Son, Jesus Christ. God Bless You All! And keep up the good fight. I have watched the miracle of the helium balloon rosary Capitol Rosary Rally video over and over. Thanks be to God for the miraculous story! Also thanks to Our Blessed Mother and St. Joseph of Cupertino who guided the helium balloon rosary along its journey. Thank you to Fr. Rick and Fr. Isaac Mary for following the inspiration to hold the Capitol Rosary Rally each Thursday! Thank you to all who came up with the helium balloon rosary idea and the building of it and the launching of it. Thank you to all who have prayed at the Capitol Rosary Rallies so far. We call on one thousand prayer warriors to join us this Thursday and every Thursday through November 1, All Saints Day. Thank you to all who pray where they are who can not get to the Capitol. God bless you. Mary keep you. Guardian Angel safeguard you. Here is the report from Thursday, August 2, 2012. Father Isaac Mary led us in the Joyful, Sorrowful, and Glorious Mysteries of the Rosary. Father Rick Heilman led us in 6 verses of the Battle Hymn of the Republic. Father Rick announced that we had 250 people praying that night. Father Rick reported that the Knights of Divine Mercy have a great lineup of speakers for the upcoming Knights First Friday meetings. It was a spectacular summer evening in prayer. Father Rick wants 1000 people praying at the rally. This was the 7th rally out of 20. Please pray the rosary at YOUR state capitol!